My very old contact card..
Well back when I was about thirteen ish roundabout 2009 during the summer our school used to host signup sheets regarding, attending ‘The Summer University programme’ which featured all different activates to do over summer from A-Z of things. 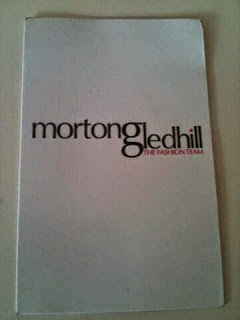 Being on a fashion note since I started out ‘EJMfashion’ through one off design’s and drawings of SS-AW and the blog was nowhere to be seen since it only launched back in 2011 I took up the ‘Morton Gledhill’ modelling course. Well I’m pleased to say it went done very well indeed and learnt a lot of wellbeing and how to apply makeup however; the fun part was that we had to train of how to walk down the runway which at first seems daunting for some girls. Me being me I took it up by stride and made a walk which made a highlight to the girls of how to do it. (To be honest I was nervous but I thought why not and let’s a make confidence boost breakout to the other girls). After the first day I was walking like another model would do however, it was leading up to show on Friday morning which featured a small audience to showcase how much we have gained in confidence and walk etc. Between all that we had a makeup session on the Tuesday to see how to apply makeup and look etc. Wednesday and Thursday was all about the show coming up. Lucky enough I got to walk out first and close the show which I felt like a feather on the soft carpet which covered the room which had draped long curtains. I’ve still got the booklet we got regarding wellbeing and applying makeup today however doing the course put me in good stead. Morton Gledhill aka ‘The fashion team’ which ran the course has over the years of being launched been known for fashion show production and model training. Being based in Huddersfield they get Ladies and gentlemen ready for the agencies throughout the world whilst, being in charge of taking on board producing fashion shows within having 30 years of experience of producing shows of all kinds within any budget. Yet all on a professional level through the leadership of ‘Bernadette Gledhill’ who herself has been modelling for over 25 years whilst being involved fashion show production. Overall if you are local within the given area of wanting to host a show or even think you have chance of being a model I personally would recommend ‘Morton Gledhill ’because, even if the course was completely out of my range I gain more confidence and more understanding about my wellbeing to a more insider to the modelling industry.